These sweet little Old Fashioned Cake Doughnut Mini Muffins will become a lunch box and snack time favourite. These treats come together in less than 30-minutes! I’m smitten. So very smitten with these old fashioned cake doughnut mini muffins. Let’s back up a bit though so I can tell you how these delicious, sweet bites came to be. I was scrolling through my Pinterest feed (something I do A LOT, are you following me over there yet?) 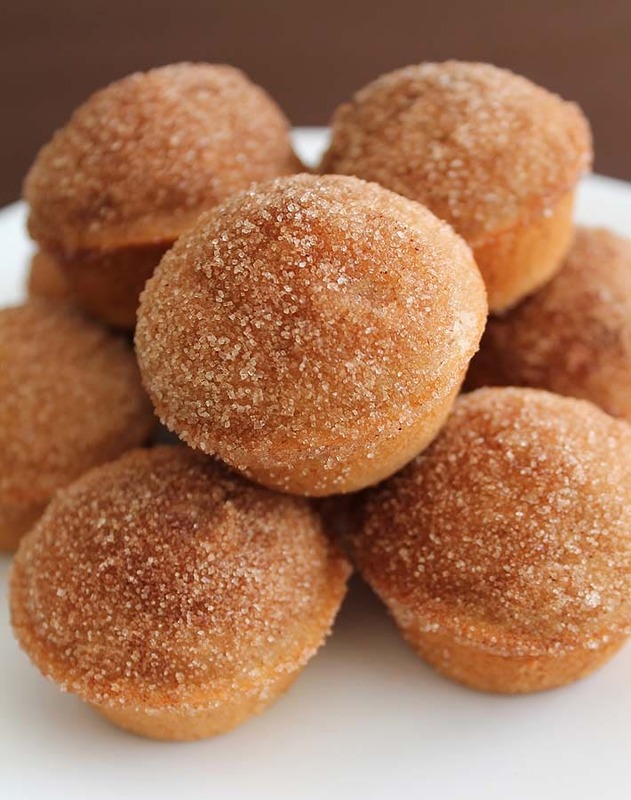 and came across this pin for Cinnamon Sugar Donuts by Texanerin. 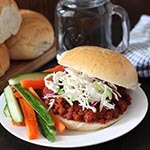 That recipe gives options to make it vegan but none to make it gluten-free so I thought, hmm…I’m up for this challenge! And I tore that challenge up, if I must say. 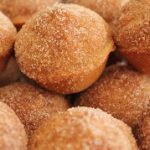 I added my own unique spin by making my doughnut muffins gluten-free, changing the ingredient ratios to make it work as a gluten-free recipe, and adding nutmeg. What kind of nutmeg is the best? I don’t buy the pre-ground stuff because by the time you get it in your kitchen, it has lost a lot of its beautiful, warm nutmeg flavour. This is why I always use freshly grated nutmeg in all my recipes, freshly grated give the BEST nutmeg flavour. Here’s a little more info on using nutmeg in your recipes. Doughnut muffins were a favourite of mine back in the day, but I think these are so much better than the real thing (which is rare…when is a knock off ever better than the real thing?). They also come together very easily and quickly. You can go from craving to satisfaction in less than 30-minutes. At the end of the 30-minutes, you’ll have 24 beautiful, sweet, sugary-spiced bites. They don’t last long here when I make them. I’m pretty sure the same will happen when you make them. 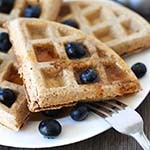 What kind of gluten-free flour should be used for this recipe? I have only tested this recipe with Bob’s Red Mill Gluten-Free All Purpose flour, the one with the red label (click the link to see it). Don’t confuse it with their 1:1 blend which will not give you the same results as it is made with a different blend of ingredients. If ingredients are substituted, your result may not be the same as mine, so please keep that in mind. And one more important note about flour….this recipe will NOT work with coconut flour. 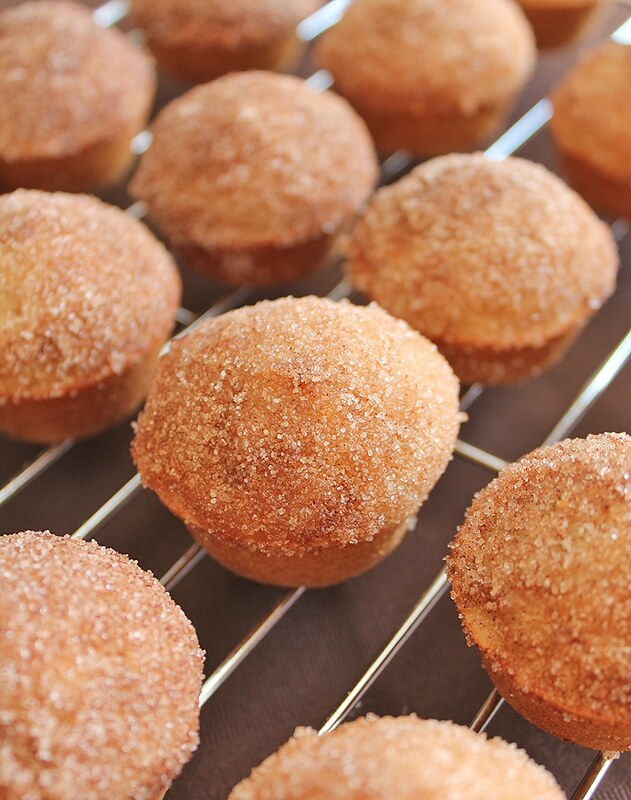 If you like this doughnut muffins recipe, pin it on Pinterest and then check out these other treats you may also like! And if you make them, share a pic with me on Instagram! I’m @delightfuladventures over there and my hashtag is #delightfuladventures. Looking forward to seeing your remake! 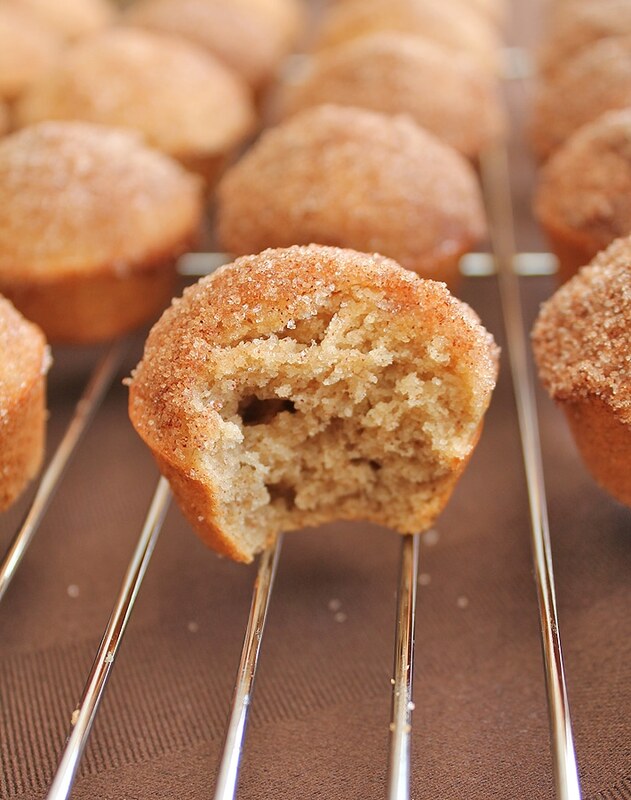 You're going to love these vegan gluten-free old fashioned cake doughnut mini muffins. 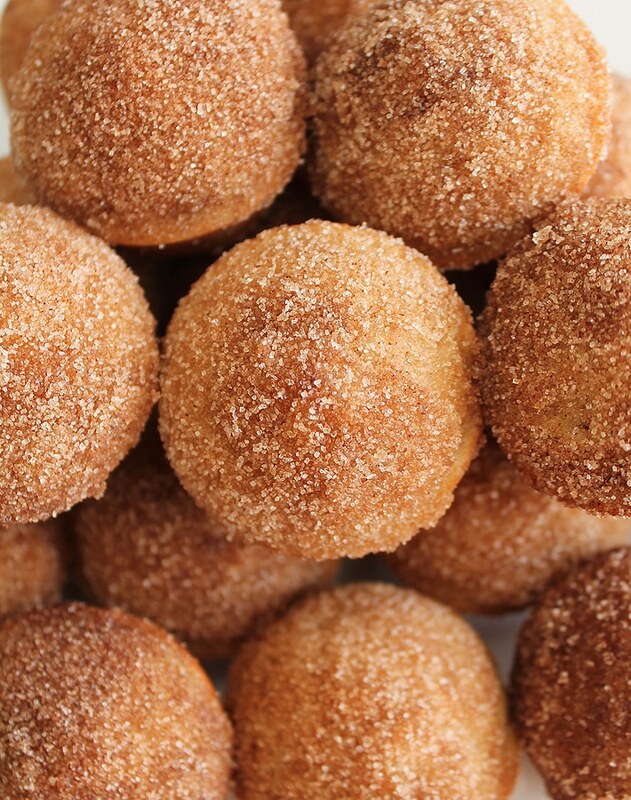 They're perfectly spiced old fashioned cake doughnuts—in muffin form! In a large bowl, whisk the flour, baking powder, salt, sugar, nutmeg, and cinnamon. In a small bowl, mix the melted coconut oil, non-dairy milk, applesauce, and vanilla together. Fill muffin tin 3/4 full. While still warm, dip 1 muffin at a time into the oil first. Make sure the entire top is coated with the oil. Then dip the same muffin into the sugar/cinnamon mixture, ensuring that the entire top is covered with the cinnamon sugar mix. Place muffin back onto cooling rack. 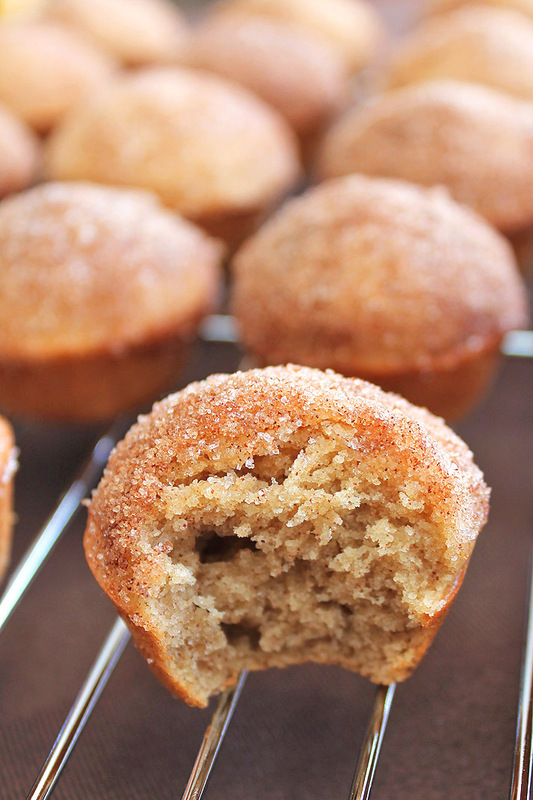 A few readers have asked what the batter for these muffins should be like after using a different type of flour. Have a look at the batter in this similar recipe to get an idea. If you use the flour recommended in this recipe and follow the recipe exactly as it is written, your recipe will work perfectly. The granulated sugar I link to in the recipe is vegan. Nutrition info listed below is for 1 of 24 doughnut muffins and is only to be used as a rough guide. Click here for more info on how nutrition info on this website is determined. Hi, can you freeze these muffins? Hi Janine, yes, BUT…I would freeze them before adding the sugar cinnamon topping. So, freeze them plain, defrost, and then add the topping. 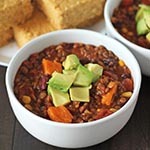 The tops would end up wet and not very nice after defrosting if you freeze with the topping. I hope this helps, let me know how it goes! what if i take out the cinnamon and the nutmeg? If you take out the cinnamon and nutmeg, that takes away all the flavour and what makes it an “old fashioned” cake doughnut muffin. An old fashioned cake doughnut is specifically flavoured with those two spices. That being said, the texture should be fine, it’s just the flavour that may be off. I cant wait to try this. Any substitute for Nutmeg? Hi there! Nutmeg is what gives the doughnuts the classic old fashioned doughnut flavour, but if you can’t use it, I would suggest adding more cinnamon in its place, they will still be delicious 🙂 Let me know how it goes! Hey! I was wondering if I could use all purpose flour instead of GF flour? I am so excited to try these! Also, I was wondering, is there any way to substitute the applesauce? Hi did you use unsweetened almond milk or sweetened almond milk. Do you use Bob’s Red Mill 1to1 flour? I just made these for my multi food allergic kiddos to eat on Christmas morning. They each got a sample one and the verdict was “yummy” from my two year old and “mom, from now on you should only make this kind of muffin” from my four year old! Success! Thank you so much for the recipe!